Natural gas is a highly combustible fuel found in the crust of the earth. The volatility of the energy commodity is both in its physical properties and price. When it comes to the price of natural gas, there tends to be extreme variance over time. In fact, natural gas is one of the most volatile futures contracts that trade on U.S. exchanges. Natural gas futures and options trade on the New York Mercantile Division (NYMEX) of the Chicago Mercantile Exchange (CME). Each contract represents 10,000 MMBtu’s or million British Thermal Units of the energy commodity. Since the price of natural gas tends to move around a lot, the futures contract attracts producers and consumers who hedge production output or requirements. Additionally, volatile markets that have many market participants creating volume on a daily basis tend to attract investors and speculators who look to make money on price movements. Natural gas futures commenced trading on NYMEX in 1990 and over the past almost three decades, increasing interest in the market has led to a steady rise in volumes traded. As in many futures contracts, there is a mechanism to make or take actual physical delivery of natural gas. The NYMEX contract calls for delivery at Henry Hub located in Erath, Louisiana. In the natural gas market, Henry Hub is a benchmark price in the United States. Henry Hub is a central location for delivery, but natural gas trades all over the United States. However, the price for the energy commodity is different in other locations because of various factors. Supply and demand in other regions of the U.S. determine the local price of the energy commodity. Therefore, natural gas on the East Coast, the West Coast, the Mid-West or in other areas will often trade at a premium or discount to the Henry Hub price and the differential or “basis” serves as a comparison to the benchmark Henry Hub price. The success of the futures market in the energy commodity has caused more trading and investment products to burst onto the scene over recent years. Exchange Traded Funds (ETFs) and Exchange Traded Notes (ETNs) are both examples of market vehicles that attract traders and investors to the natural gas market without the need to open a futures or futures options account. The first ETF product in natural gas was the United States Natural Gas (UNG) vehicle. UNG seeks to replicate daily changes in percentage terms of the price of natural gas delivered at the Henry Hub, as measured by the daily changes in the price of a specified short-term futures contract. Therefore, UNG tracks movements in the price of the futures that trade on NYMEX. UNG is an unleveraged ETF product. A buyer of UNG would be a trader or investor who believes the price of the energy commodity will move higher. There are other ETN products that magnify the already volatile natural gas price. UGAZ or the Velocity Shares 3x Long Natural Gas ETN is a product that seeks to replicate three times the price movement of natural gas. If the price of natural gas moves higher, UGAZ tends to move higher. DGAZ or the Velocity Shares 3x Short Natural Gas ETN is a product that seeking to replicate three times the price movement of natural gas. If the price of natural gas moves lower, DGAZ tends to move higher. These ETN products are strictly short-term trading vehicles most suited for investors or traders looking at an intraday or at most a couple of days’ time horizons. The huge volatility in the prices of UGAZ and DGAZ attract lots of volume which translates to volume in the natural gas futures market as the issuers of these market products turn to the NYMEX contracts to hedge their price risks. There are other natural gas ETN vehicles, BOIL or the ProShares Ultra Bloomberg Natural Gas ETN is a long product that seeks to replicate twice the daily price movements in the energy commodity. ETF and ETN products have increased the addressable market for natural gas but keep in mind that the leveraged products are not an investment but short-term trading instruments. Another way that market participants get involved in the natural gas market is through investments in those companies that explore for and produce the energy commodity. There are many companies in the United States that are in the business of searching for and extracting natural gas from the crust of the earth. Naturally, as the price of natural gas moves higher, these companies tend to experience an increase in earnings. However, the success of an investment in a producing company is not totally related to price always. One of the risks of investing in a natural gas producer, aside from the price of the commodity, is the ability of these companies to produce output and make money on selling that product to the market. There are ETF and ETN products available that represent a basket of companies in the production business and some of those vehicles contain leverage. Since the price of natural gas is so volatile, the many market participants that trade in the market are always looking for clues as to the path of least resistance for prices. There are five critical clues that can assist investors and traders when it comes to understanding the current state of the market and the outlook for prices in the immediate and medium-term future. Each week, on Thursdays at 10:30 AM EST the Energy Information Agency (EIA) in the United States releases inventory numbers on the total amount of natural gas in storage across the United States. The Weekly Natural Gas Storage Report tells the market if the total number of BTU’s has increased or decreased over the previous week; it is a window into the short-term supply and demand fundamentals. During the spring and summer months, stockpiles tend to rise and during the late fall and winter season, they tend to fall as heating demand causes an outflow of the energy commodity. Many analysts issue forecasts for the weekly report in advance of its release. If the report varies from market expectations, the price of natural gas tends to move, sometimes explosively. Since there are so many market participants involved in trading natural gas, the trend of the price can offer a clue as to the path of least resistance for prices. Technical-trend following traders tend to go long when the trend is higher and short when it is lower. This activity in the market can, at times, exacerbate trends making the price move higher or lower than equilibrium levels. Open interest is the total number of long and short positions on natural gas futures contracts on NYMEX. Increasing or decreasing open interest often provides clues for the behavior of speculators in the market. Remember, speculators who go long or short do so to make money on price movement. They eventually need to reverse and cover risk positions. In natural gas, when long or short interest climbs to high historical levels, the price can reverse in violent fashion. Each week the CFTC releases commitment of trader’s data that provides insight into the breakdown of open interest in natural gas and all futures markets. Technology is always changing the way that companies in the energy business operate. The advent of hydraulic fracking has reduced the production cost of natural gas but at the same time, it has caused some environmental issues. Additionally, in 2016 the first shipment of liquefied natural gas (LNG) left the U.S. for an international destination. 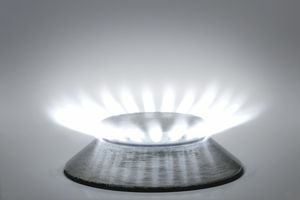 LNG has opened a new demand vertical for natural gas that will increase demand in the years ahead. Finally, changes in regulations when it comes to producing and trading natural gas can increase or decrease production costs and prices over time. The regulatory aspects of the energy commodity depend on the political landscape in the United States and will often influence prices as changes occur. Finally, perhaps the most important determinate of the price of natural gas on a short to medium term basis is the weather forecast. A hot summer will increase the demand for air conditioning which in turn increases power or electricity demand. As natural gas is a critical ingredient in the production of electricity, a very hot summer can increase demand during a time when storage facilities experience the height of the injection season. A very cold winter can increase demand for heating exacerbating the number of withdrawals from storage facilities. As with any commodity, as demand increases prices rise and vice versa. In 2005 and 2008, Hurricanes in the Gulf of Mexico took the price of natural gas futures to all-time highs. Any storms that damage areas with major pipelines or production facilities can influence price dramatically. There are many clues to look for when trading or investing in the natural gas market. All of the clues mentioned in this piece are available free of charge. The price movements in the natural gas movements can be hair-raising at times. Since 1990 the price has traded in a range from $1.02 to $15.65 per MMBtu. It is not out of the ordinary for the price of this commodity to double or half over a very short period when fundamental changes occur in the market. Watching the five clues can help you to predict or at least explain the price movements in this combustible energy commodity.